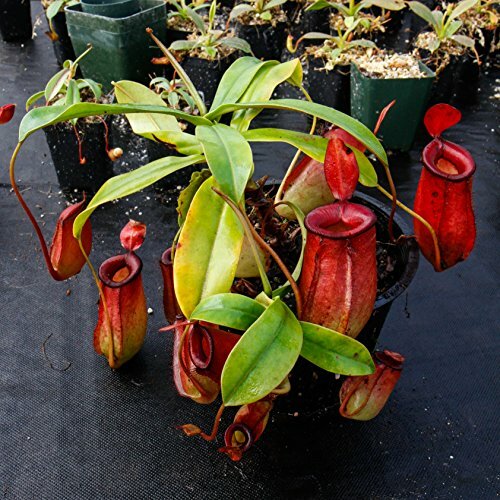 Tropical Pitcher Plant - Nepenthes Lady Luck - Carnivorous Plant by Carnivero at Nama Database. Hurry! Limited time offer. Offer valid only while supplies last. Nepenthes 'Lady Luck' is a beautiful tropical pitcher plant hybrid selected as the best plant from thousands in the worldwide breeding programs. Nepenthes 'Lady Luck' is a beautiful tropical pitcher plant hybrid selected as the best plant from thousands in the worldwide breeding programs. It's a cross between a red Nepenthes ampullaria and Nepenthes ventricosa. This plant is amazingly vigorous and can be grown in wide range of conditions. It would make an excellent windowsill or terrarium plant or could do well outside in a mild climate. The first photo is one of our mature specimens. The next photos are representative of the 3" pot plants you will receive. Growing instructions, a pot and soil will be included in the shipment. Surprisingly easy to grow in a sunny window or on a deck or patio in mild climates. Free Expedited Shipping with Live Arrival Guarantee! Detailed care instructions, soil and pot included in package. If you have any questions about this product by Carnivero, contact us by completing and submitting the form below. If you are looking for a specif part number, please include it with your message.